Decolorizing section is a major part of palm oil mill process. Decolorizing section is mainly used to remove oil pigment, residual soap particles and metal ions. 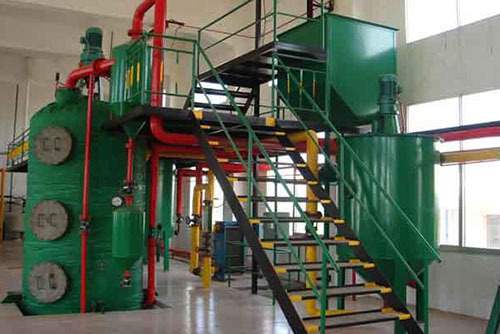 Under negative pressure, the mechanical mixing method combined with steam mixing will improve the decolorizing effect. The degumming oil firstly enters into the heater to be heated to the appropriate temperature of 110 degrees Celsius, and then goes to the blenching earth mixing tank. The blenching earth is delivered from the low blenching box to the temporary tank by wind. The blenching earth is added by automatic metering and is interlockly with the oil. The oil mixed with the blenching earth overflows into the continuous decolorizer, which is stirred by non-powered steam. The decolorized oil enters into the two alternate leaf filters to be filtered. Then the filtered oil enters the decolorized oil storage tank through the security filter. The decolorized oil storage tank is designed as the vacuum tank with the nozzle inside, so as to prevent the decolorized oil contacting with air and influencing its peroxide value and color reversion.